Most companies that shipping products will use pallets. Pallets, as a common freight packaging option, are used in logistics of the transportation process, from storing the items in a warehouse to enabling them to be moved in bulk as well as keeping them protected and allow for easy movements during transportation. 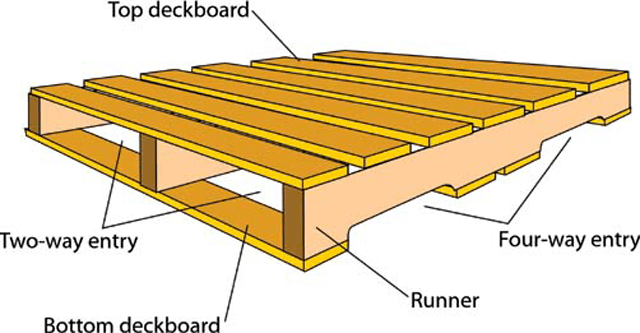 A pallet can be described as a horizontal platform device, which is used as a base for transporting, handling, storing and assembling both products and materials as a unit load. In addition to this, pallets are designed to ensure that no damage occurs to the goods inside when another pallet is loaded on top of it. Just like shipping containers, with safe and easy-handle properties, pallets are widely used across the world in almost every warehouse, truck and cargo ship. As compared to non-palletized dispatching of cargo consignments, pallet shipping is definitely costly. However, their cost-effectiveness by effectively minimizing the potential risks and damages to the consignments makes the pallet cargo a must-have in the freight shipping industry. When it comes to pallet material, there are two chief options at your disposal: Plastic Pallets and Wooden Pallets. This post will assess the advantages and disadvantages associated with both in order to help you make the right decision for your shipping needs. So, keep on reading to find out all you need to know. There are many advantages associated with the use of wooden pallets. One of the main reasons people opt for this type of pallet is because it tends to be the least expensive. This is ideal for those purchasing on a budget. Pallets made of wood are also easy to repair, which represents another way in which you can save money if you go for this option. All you need to do is remove and replace one of the broken wood boards, rather than replace the pallet as a whole. In addition to this, wood offers benefits in relation to recycling. The wood used to construct the pallet can be collected from recycled materials and once the pallet is no longer needed it can then be recycled into paper and mulch. Aside from this, wood boasts other benefits in the sense that it is a lot easier and quicker to construct. This is especially significant for those who are using a substantial number of pallets. On the whole wood is strong and robust. It also offers a greater level of security because they boast a high level of friction, this is even better compared with plastic. This ensures that the shipment do not easily slide off when they are on the pallet. There are also some negatives you need to bear in mind as well. Wood has its own disadvantages. One of the main problems is the fact that wood is an organic material and consequently it can quickly warp, weaken or splinter. Thus, whilst you may save money in relation to your initial start up costs, you may actually end up spending more because of continual reordering costs. The individuals who handle the pallets often experience nasty surprises because of protruding nails or splinters. Needless to say, a nail or splinter digging in your hand is not a pleasant experience. Aside from this, wood pallets are extremely difficult to clean. This is because bacteria and fungus is encouraged to grow when wood becomes wet. Last but not least, wood has to be treated in order to be shipped internationally because wood can contain invasive species of insects or plant diseases. Plastic pallets also offer an excellent solution to pallet logistics. One of the best things about plastic is the fact that it lasts for a long time. You can expect to get at least ten years of use out of plastic material, thus you can save money in the long run. Plastic also provides you with another way to reduce your expenditure by reducing shipping costs, as plastic is approximately 30 percent lighter than wood. You also don’t have to deal with interruptions in delivery. When shipping wood you have timber pallet regulations to contend with. Plastic is also resistant to chemicals, such as alkalis and acids, and thus they can be cleaned easily. In order to remove bacteria plastic pallets can be chemically sanitised, steam cleaned or hot washed. If that wasn’t enough, they are entirely recyclable and can be turned back into a new pallet. As mentioned earlier in this post, plastic is more expensive than wood, and thus the start up costs can be substantial. Thus, this is an obvious downside. In addition to this, another disadvantage is the fact that plastic pallets cannot be easily repaired. If the plastic breaks or cracks, you would have to melt it down and re-mould it in order to make another one. This is obviously a lengthy and inefficient process and thus would lead most people to purchasing a new pallet instead. As touched upon earlier, plastic does not boast as much friction as wood does. This is detrimental because the materials and products can easily end up sliding or falling off the pallet if you are not careful. Thus, this is something you should be wary of. Moreover, you need to be sure you purchase quality plastic otherwise the pallet can easily be too weak and susceptible to breakages. When selecting the right material for your logistics and transportation needs, there is no right or wrong solution. It is all about finding what works for you. Different cargo types, different shipping method, different situations. Just make sure you assess everything as a whole.